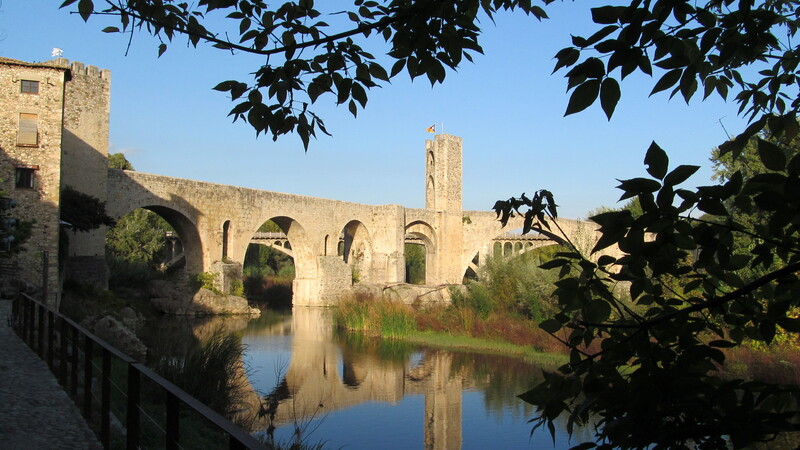 I am back in Besalú, located two short hours north of Barcelona. Settlement here goes back to preRoman times apparently. I had read about it as I searched the web for Romanesque buildings. In the spring of 2011, I visited briefly and ate extremely well at lunch. I returned this past spring and spent 5 nights nearby in the countryside, in a house build in the 1760s with an attached fortified tower from the 12th century. It is within a hour of the sea and the Pyrenees provide the backdrop. We are not much more than an hour from the French border, near Perpignan. And it is green. This is not semi-arid Spain. As green as Ireland, and with much better weather, and much better food. I feel comfortable and at home here. I am back for four nights. I met an artist and his partner here in April, by chance, and bought an original print of Don Quixote from them which now graces my living room. We will be getting together for lunch on Saturday high up on a local mountain, and I have been promised a risotto with wild mushrooms. I am glad that I am here; a problem with sciatica has flared up, from so much time in the car, shifting gears etc. It is in the right hip. Staying put, regular walks around the village and in the vicinity are resolving the problem. 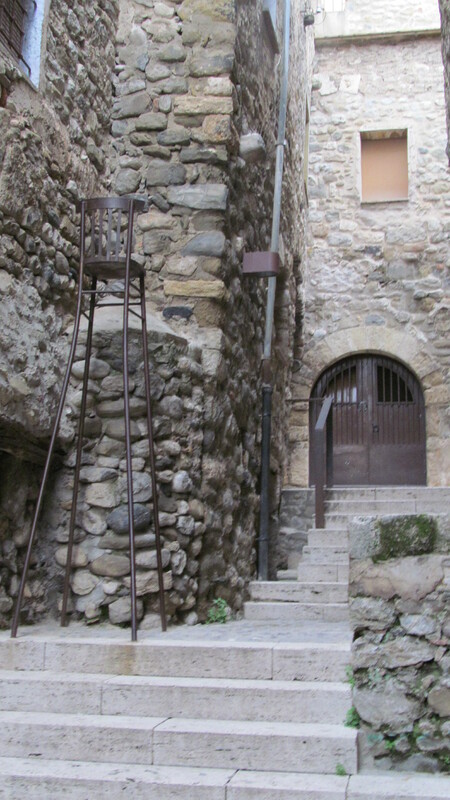 I now present you with a tour of Besalú, with minimal narration, if this is possible with me! This is the iconic monument, an impressive fortified five arch medieval bridge. I was shown some fascinating photos on a guided tour yesterday, showing some of its history, including the destruction of the first two arches by the French in the Napoleonic years. The town is full of narrow winding streets. Like everywhere in Spain, there is public art. 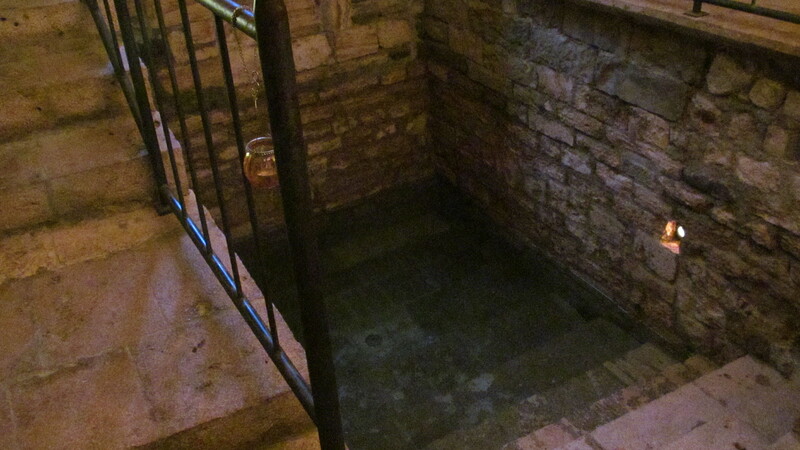 This very high chair is one of a number of chairs playfully installed in one of these passageways. 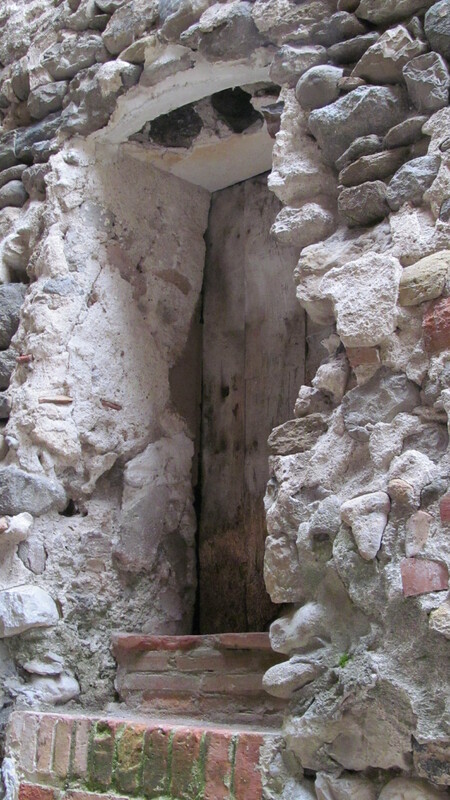 Here is a ancient doorway just across from the chair – obviously for someone of a significantly different stature. It would measure a little over one metre. Set into the century old buildings are modern shops such as this butcher shop. 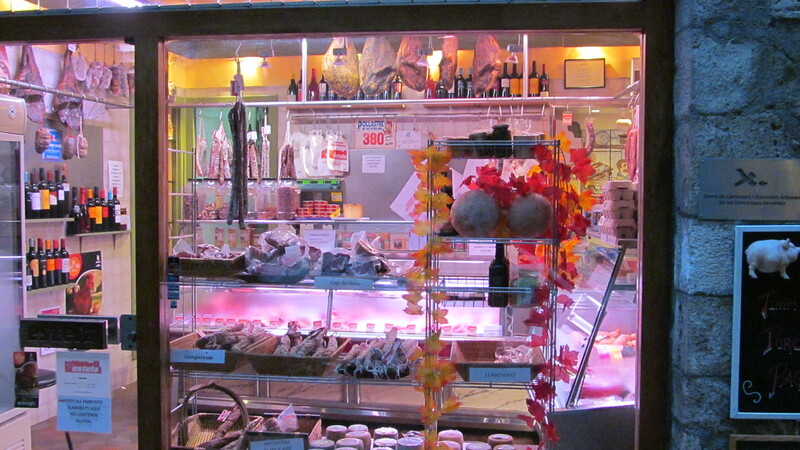 In the background, you can see the cured hams hanging from the ceiling, complete with their hoofs still attached. In the foreground, every variation of sausage possible. Cheeses complete the window, on the bottom shelf. They also sell local vintages, like the supermarkets. 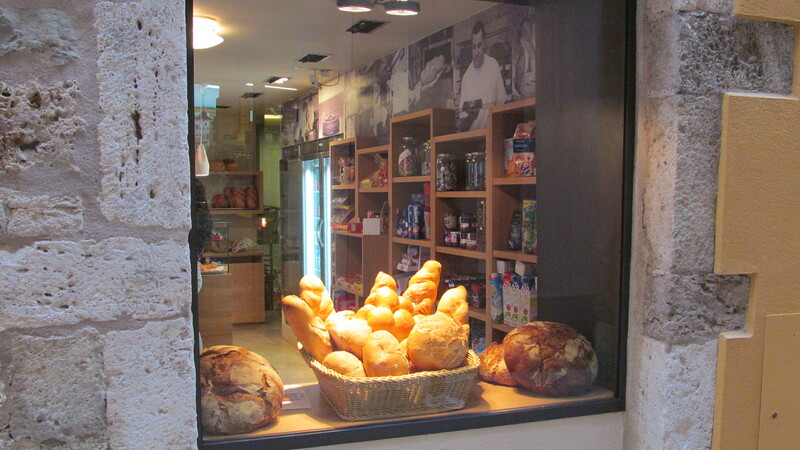 Everywhere are found their bread shops, many with tantalizing window displays. The Spaniards buy their daily bread daily, enough for that one day. It is a ritual. Even the smallest village will have a bakery, sometimes a mere hole in the wall, and you will see the women of the village heading to it in mid morning and returning home with the size of a loaf that will be enough for that day. The ritual repeats itself every morning. It is so integral to village, town and even city culture. Finally, I have decided to forego taking photos of their many patisseries. I have been losing my own sweet tooth and I would not want any of you hopping on a plane for the wrong reason. Come, for sure, but for some of the many reasons that I have been sharing. 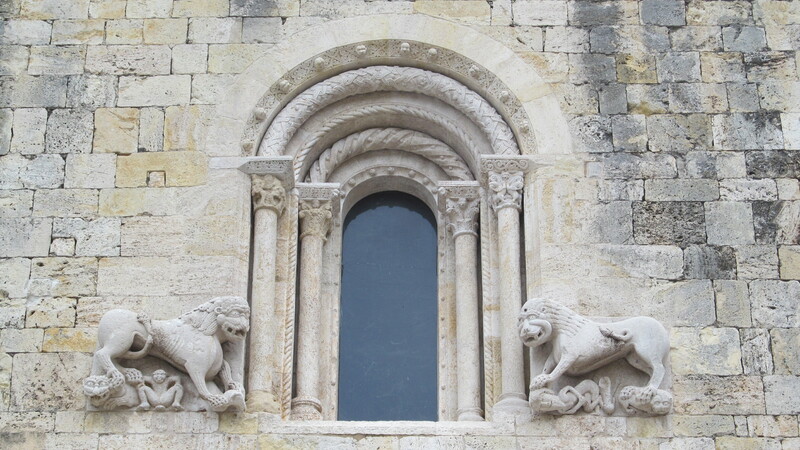 One final photo – the window in the facade of the 12th century church in the central square; I love Romanesque art, architecture, sculpture – it is infinite in its variety and playfulness. What are these lions doing? Protecting the faithful from the forces of evil represented by these strange little creatures or are they reminding the faithful not to stray or they too will be destroyed ? There is so often an ambiguous element in this art. The people of the period must have enjoyed coming to church as much for the art as for the rites. They didn’t have television. This entry was posted in Uncategorized on October 27, 2012 by agnotarte. the pictures are amazing too. We’d love to go to Spain with you! I sometimes think that I would love to organize a group of friends to come here. My big brother and his wife joined me a couple of years and fell in love with the country very quickly.